The Dark Knight Rises is a 2012 thriller-superhero film directed by Christopher Nolan, who co-wrote the screenplay with his brother Jonathan Nolan, and the story with David S. Goyer. 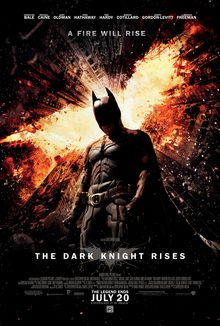 Featuring the DC Comics character Batman, the film is the final installment in Nolan's Batman film trilogy, and the sequel to Batman Begins and The Dark Knight . Christian Bale reprises the lead role of Bruce Wayne/Batman, with a returning cast of allies: Michael Caine as Alfred Pennyworth, Gary Oldman as James Gordon, and Morgan Freeman as Lucius Fox. The film introduces Selina Kyle , and Bane . Eight years after the events of The Dark Knight, merciless revolutionary Bane forces an older Bruce Wayne to resume his role as Batman and save Gotham City from nuclear destruction. The Dark Knight Rises is a 2012 thriller-superhero film directed by Christopher Nolan, who co-wrote the screenplay with his brother Jonathan Nolan, and the story with David S. Goyer. Featuring the DC Comics character Batman, the film is the final installment in Nolan's Batman film trilogy, and the sequel to Batman Begins (2005) and The Dark Knight (2008). Christian Bale reprises the lead role of Bruce Wayne/Batman, with a returning cast of allies: Michael Caine as Alfred Pennyworth, Gary Oldman as James Gordon, and Morgan Freeman as Lucius Fox. The film introduces Selina Kyle (Anne Hathaway), and Bane (Tom Hardy). Eight years after the events of The Dark Knight, merciless revolutionary Bane forces an older Bruce Wayne to resume his role as Batman and save Gotham City from nuclear destruction. Christopher Nolan was hesitant about returning to the series for a second time, but agreed after developing a story with his brother and Goyer that he felt would conclude the series on a satisfactory note. Nolan drew inspiration from Bane's comic book debut in the 1993 "Knightfall" storyline, the 1986 series The Dark Knight Returns, and the 1999 storyline "No Man's Land". Filming took place in locations including Jodhpur, London, Nottingham, Glasgow, Los Angeles, New York City, Newark, and Pittsburgh. Nolan used IMAX 70 mm film cameras for much of the filming, including the first six minutes of the film, to optimize the quality of the picture. A vehicle variation of the Batplane and Batcopter termed the "Bat", an underground prison set, and a new Batcave set were created specifically for the film. As with The Dark Knight, viral marketing campaigns began early during production. When filming concluded, Warner Bros. refocused its campaign: developing promotional websites, releasing the first six minutes of the film, screening theatrical trailers, and sending out information regarding the film's plot. Really very strong moment from the movie . The scene is awesome !